The Fish & Fries were a promo item from Indonesia that I've wanted to try since I first saw them posted on the McDonald's Indonesia official website in late 2015. I didn't have any trips down to Indonesia planned when I first saw them, and I had actually tasked a few colleagues to bring me a box back from one of their trip (my company has an office down there now) but it just never worked out. 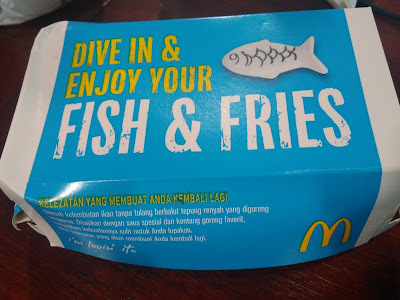 The Fish & Fries actually disappeared from the website in March 2016, and I simply expected that the promo had run its course. 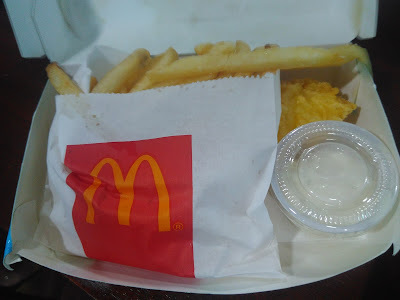 Much to my surprise when I finally made a trip down to Jakarta in April, that it was still available through McDelivery! 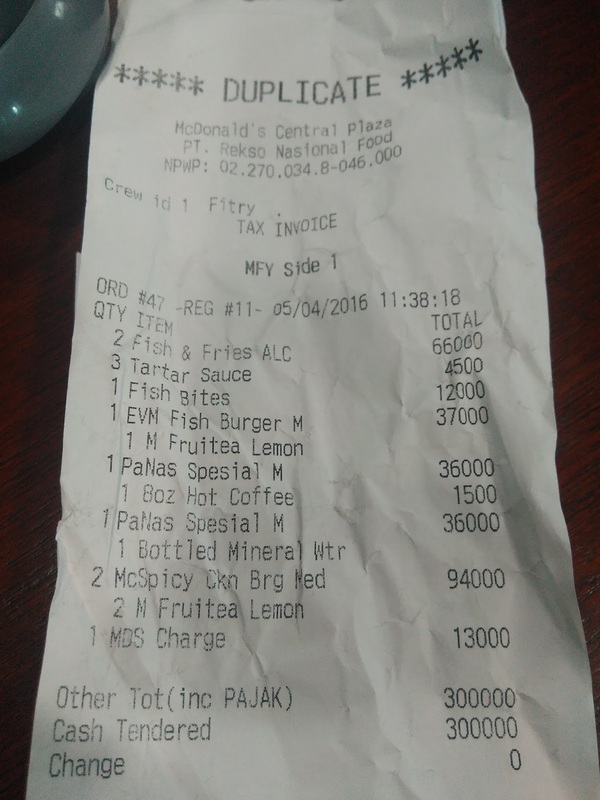 I forced our office to have McDonald's for lunch one afternoon so I could give it a try. Now, I've never had the best experience with McDelivery in the past, as the food never really arrives in the best shape, and something undoubtedly goes wrong...this time was no different. They had "cancelled" the promotional Crunchy Brownie McFlurry I ordered, and instead of giving me cup of the other promo "Onion Dip" I ordered, they brought a cup of Tartar Sauce instead! At least the Fish & Fries made it, albeit a bit crushed. You might ask why didn't I just go to a branch and get everything? Well, Jakarta traffic is terrible, so the nearest McDonald's was about an hour away. McDelivery uses scooters to beat the traffic as best it can. In the end, it still took about 35 minutes for the food to arrive from when I placed the order. 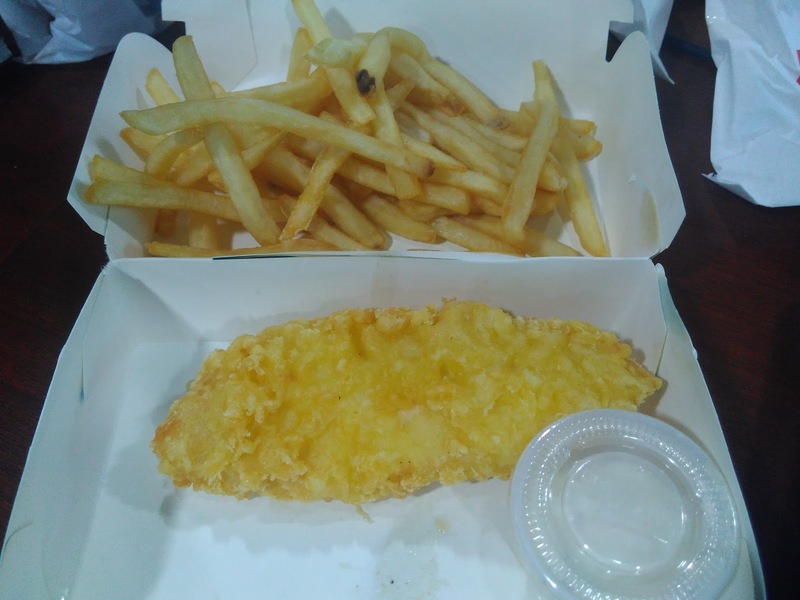 Despite being somewhat overpriced, the fish was actually pretty decent quality. 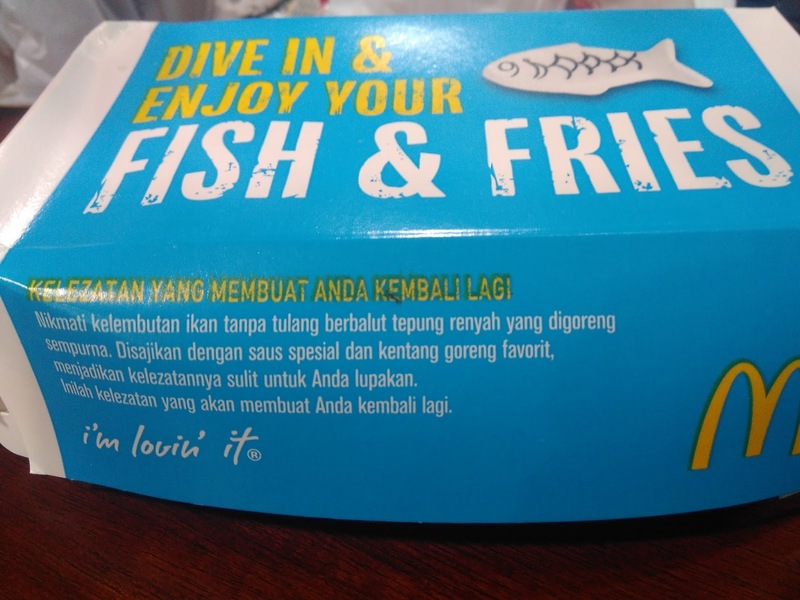 Even though the promotional images showed a long and narrow piece of fish exactly like what was served, I had expected the fish to simply be reshaped fillet-o-fish, this used neither the traditional FoF batter, nor the same minced fish. 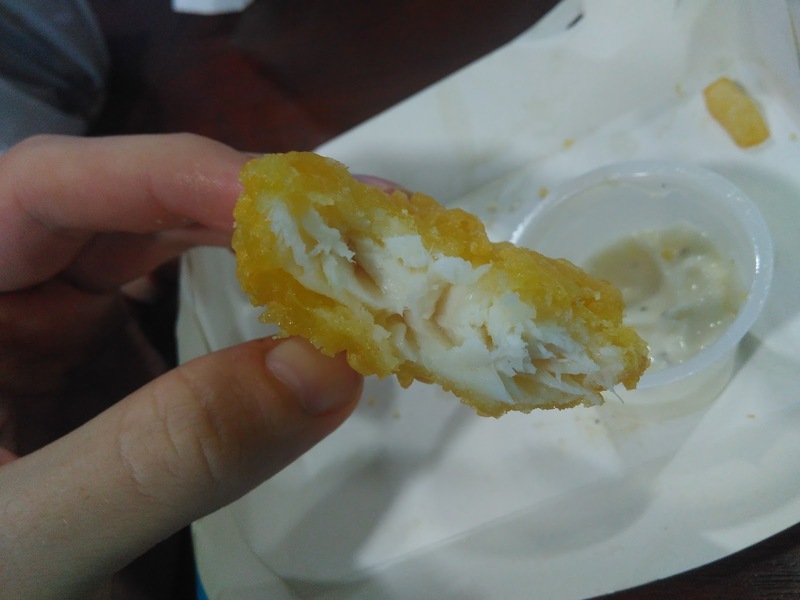 This was actually very flaky and surprisingly plump piece of fish. It looked, felt and tasted like a respectable piece of fish and chips. 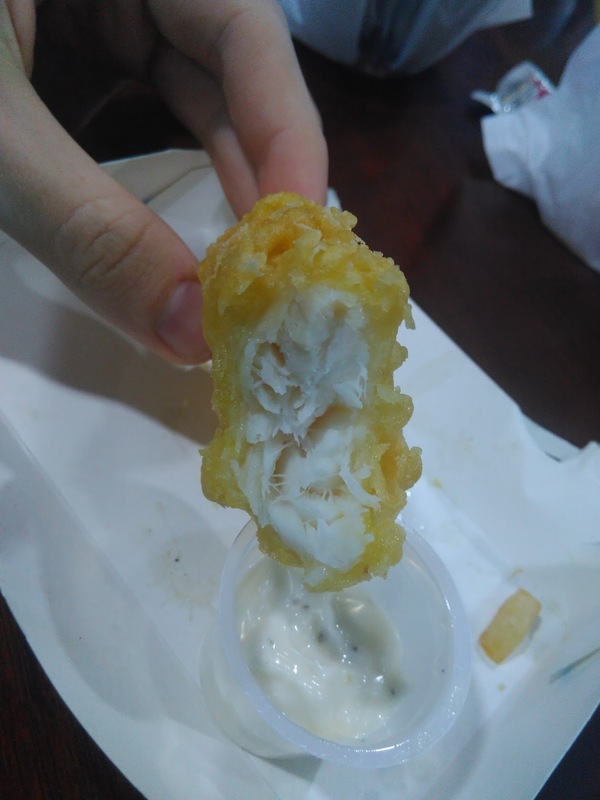 The batter reminded me more of tempura batter than fish and chips beer batter. 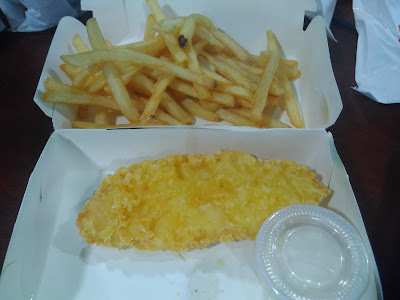 The problem was that it certainly didn't deserve to be eaten via McDelivery and I have no doubt would have been even better when served fresh. The piece I had was ice cold, and the batter, albeit was crunchy with it's tempura-esc balls of batter, still had an overall "fried an hour ago" sogginess to it, but it wasn't greasy. 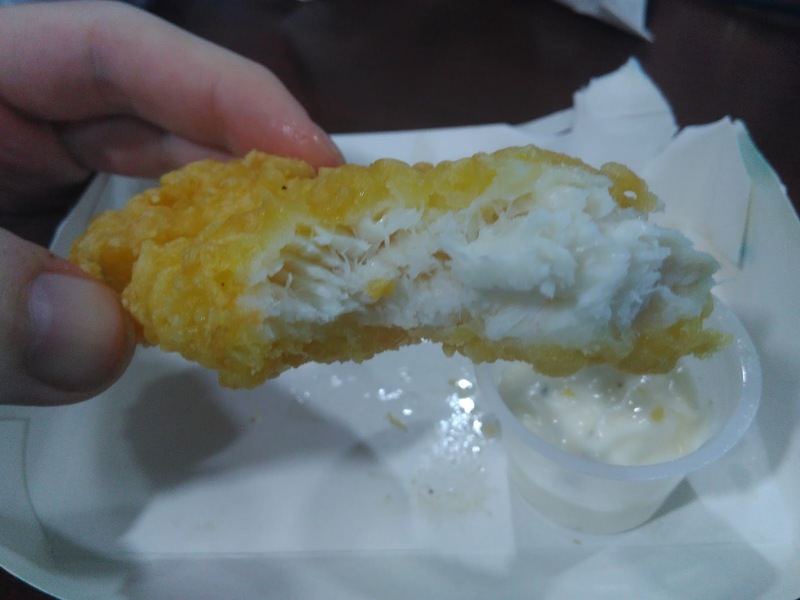 This quality of fish didn't taste like standard McDonald's fare at all, if this was sold in a box at a supermarket, I wouldn't complain with that purchase. The biggest problem had to have been the serving size. Although I don't try and eat that much fried food in one sitting, I would have needed another 2-3 pieces before I could call this a meal.